Behold the power of holograms! Why I like it: Like 1992-93 Ultra, and many of the sets yet to come, it's the design. It was basically a toss-up which would rank #15 and which would be #16, and this set got the nod over 1975-76 Topps for the sole reason that I have memories of this set being new, whereas the Topps set was issued almost a decade before I was born. Set size/Completion: 146 cards, I have 141 of them, or 96.6% according to the Trading Card Database. This is one of those rare non-foil/finest sets that you really can't capture in a scan. 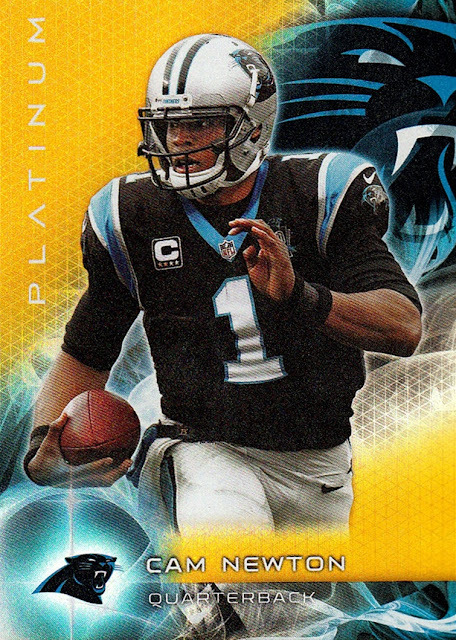 Each and every card is printed over the top of the SP hologram pattern seen at left, and in hand you can see that shining through the photo and the black bar at right. It doesn't really show in scans, although you can sort of see it in the team name at right. The first 126 cards in the set- the veterans- are done on this design. SP, as a brand, made it's debut in 1994-95 (although one could argue that the 1993-94 Special Edition set was really the birth of it) and went until 2008-09, when the NBA pulled the license from Upper Deck. 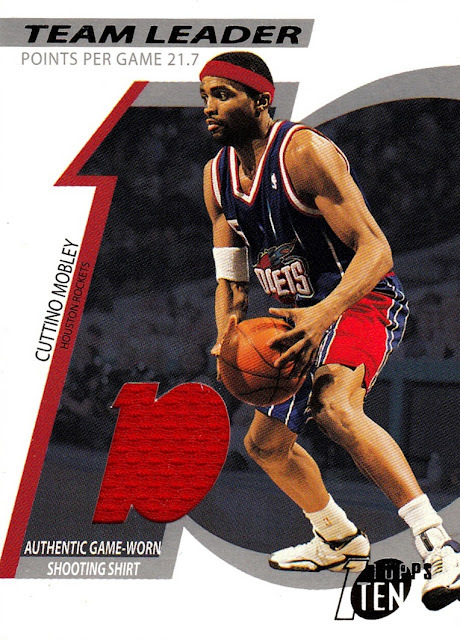 SP and later, SP Authentic (the name was changed for the 1997-98 release) is not a favorite brand of mine. (it later came back as a college release but those don't count). Most of the SP Authentic sets had the photos edited down so it was just the player and a white or close to white background. Not something I enjoy. This is the only SP set that makes my Top 20...and I could probably do a top 40 without finding another SP/SP Authentic set. But this one...this one I love. Here's what the rookie cards look like. It would have been better if they looked like the veterans. Inserts for the set were actually interesting. In the 1990s the inserts usually were. Game film...these were the big deal when the set was new. I pulled this one. These are REALLY hard to scan. 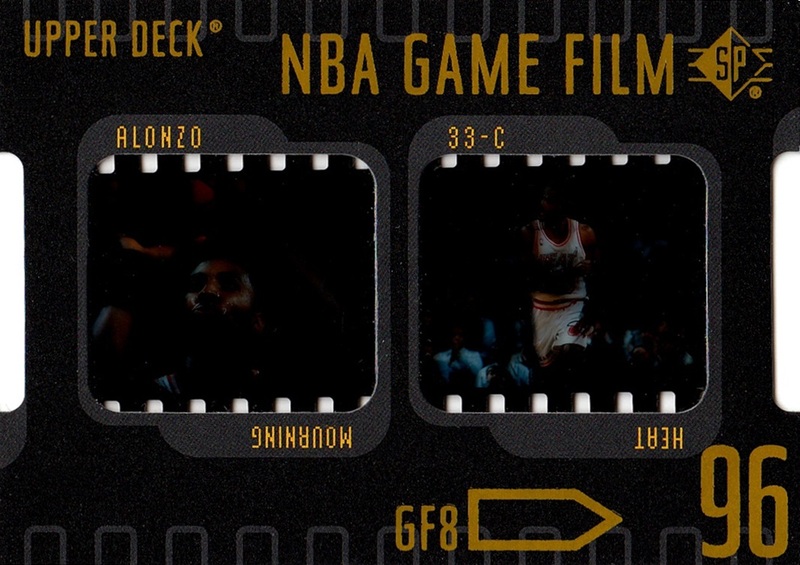 Game film would appear in 2001-02 SP Authentic as well. Why is it called "Inside Info" you ask? Because you can pull out a smaller card permanently attached to the larger one! Premium Collection Holoview made it's third and final appearance. The hologram was smaller than ever. This would be the last SP set to NOT include autographs. I said in post #1 that there were some things about this list that surprised me when I was creating it...and this is the biggest. The surprise in this case is that this is the only Topps flagship that made the Top 20! It is also the only vintage set to make the list. For the NBA, vintage is 1985-86 and older. (Although I must admit if I went past #20, both #21 and 22 would both have been vintage sets). This is also the only set on the list older than I am. Why I like it: This was the first set that was truly done right, the only thing missing to make it perfect is the lack of coach cards. Set size/Completion: 330 cards, and I have it completed! As you readers all know by now, I love history. I love the sport of basketball. So naturally I love vintage cards! In fact, I learned about the history of the sport by chasing down vintage cards, or even just cards a year or two older than 1995-96 when I started collecting, there is really a wealth of information crammed onto cards, and I have spent now 20 years learning as much as I possibly can. And even though I might not remember everything I read, I can always pull up my scan folder and start reading. As I mentioned above, this is the only Topps flagship that made my Top 20, and that is the biggest surprise to me of all. 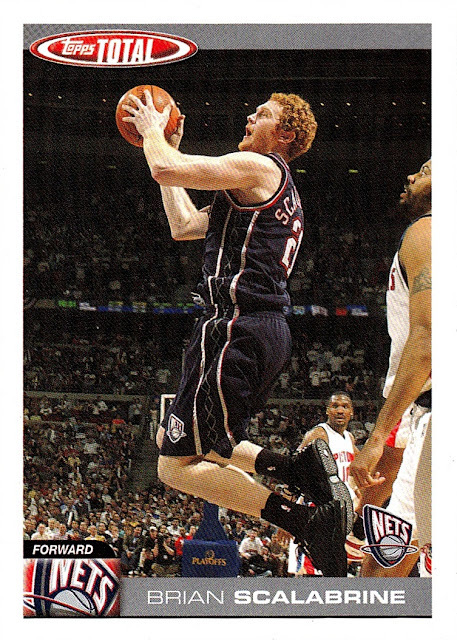 The Topps flagship set was the only game around when it came to basketball for more than a decade. 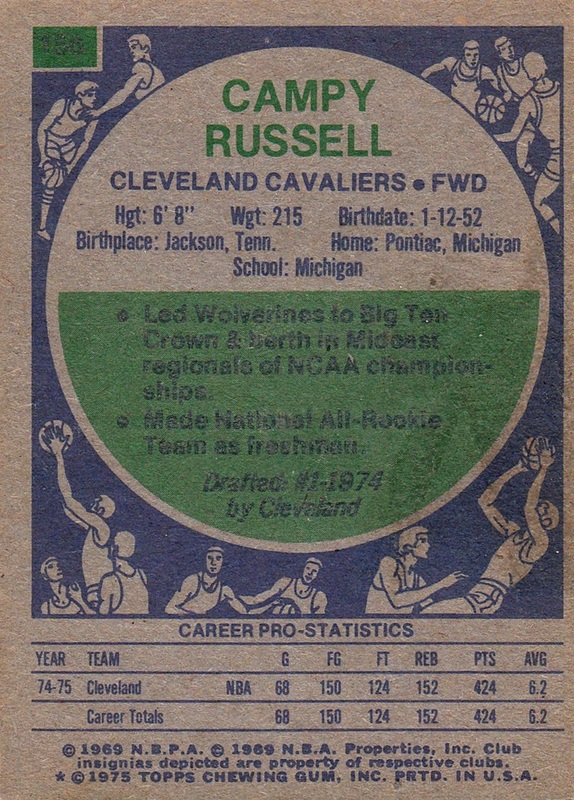 Issued in 1957-58, and then no NBA cards at all until 1969-70, when Topps came back. They were again the only game in town until 1981-82, when they walked away from the NBA, not to return until 1992-93. 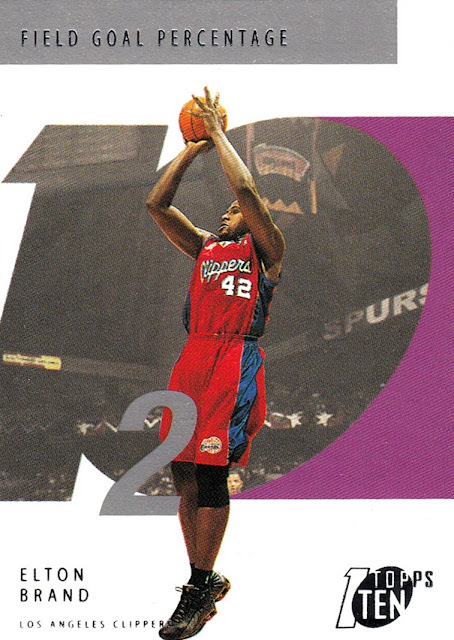 They would stay until the NBA yanked their license during the 2009-10 season. 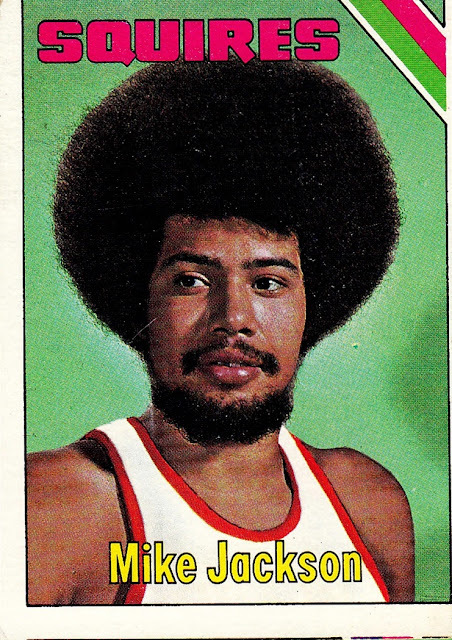 This was, by far, Topps' best effort of the 1970s. The set went to 330 cards which is the second largest Topps flagship set ever, tied with the aforementioned 2009-10. 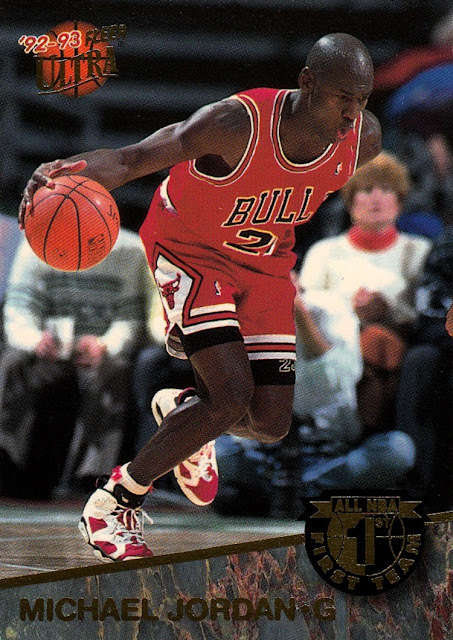 Only 1992-93, 1993-94 and 1994-95 were larger, at 396 cards each. 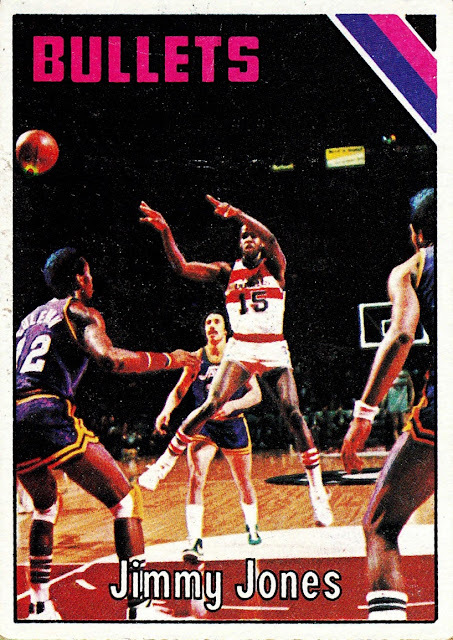 This set also included more action photos than any other Topps set before it, and there were no cards that had the team names edited out. Although there are still a large number of posed photos, there are more action shots in 1975-76 than there were in all the Topps base sets that came before it- combined! 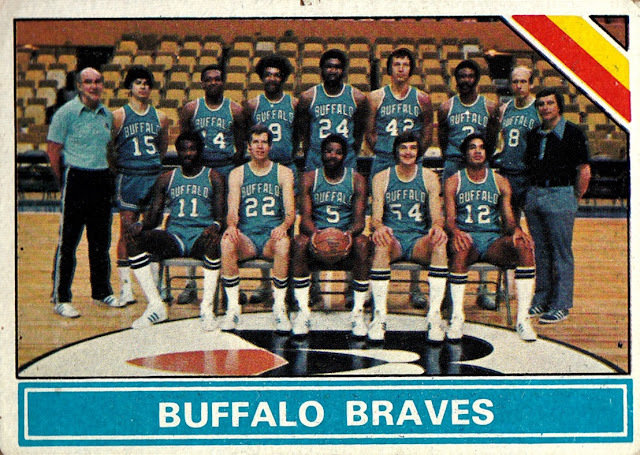 This was also the last year of the ABA's existence. Keep in mind, the scan makes it easier to read....and that is not easy to read at all! (It's #156, by the way). On several occasions I had to find the player's name on the checklist because the card was not readable at all. 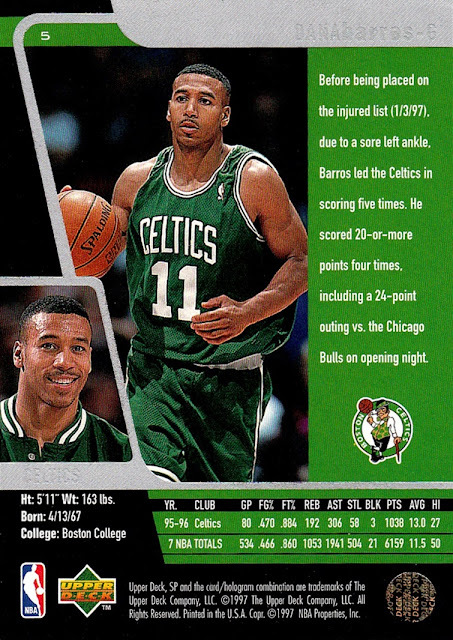 The set was the second to feature team cards. For the first time ever- and the only time in Topps history- teams got two cards. One had the team's yearly leaders, one was a checklist. 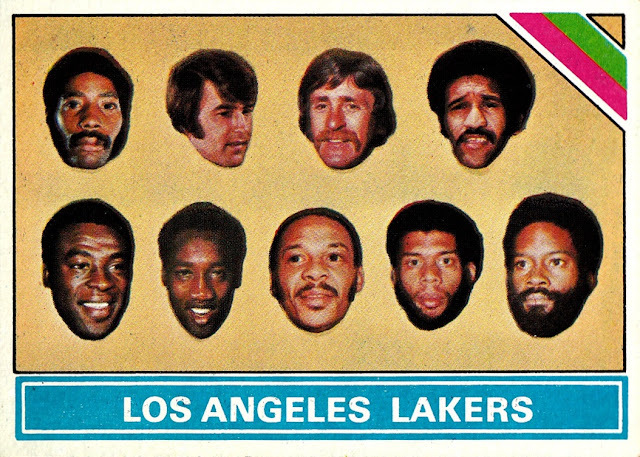 but one NBA and one ABA team got the first ever "Floating disembodied heads" cards. Eek! Interestingly, they didn't bother to get a new photo for the Milwaukee Bucks- Kareem Abdul-Jabbar appear on the Bucks team card as well. 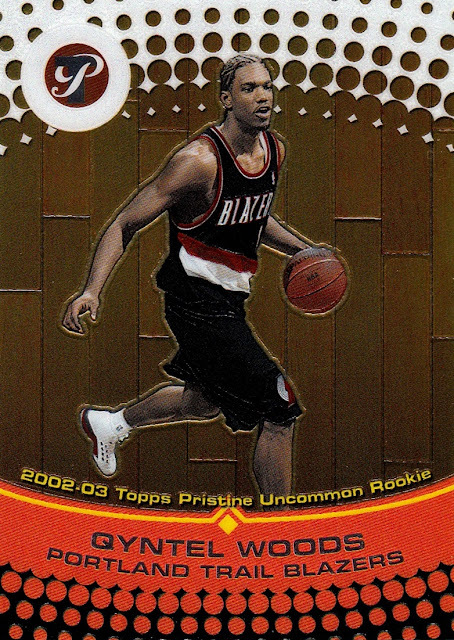 Unfortunately there are some players who Topps never bothered to give even a single card to, and their only appearance on cardboard is on the team cards. Topps would not issue team cards again until 1981-82, which I would consider set #21 in this 20 set countdown. 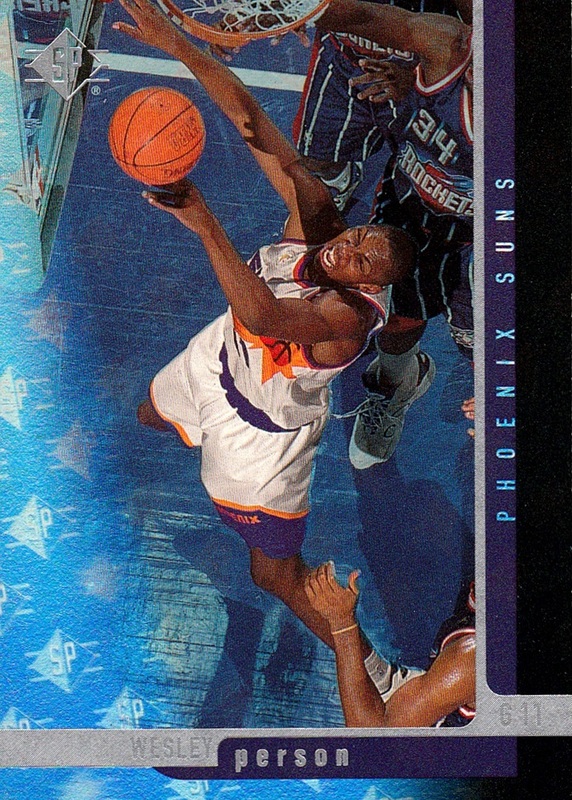 while most of the NBA cards were action photos- about 3/4ths of them. 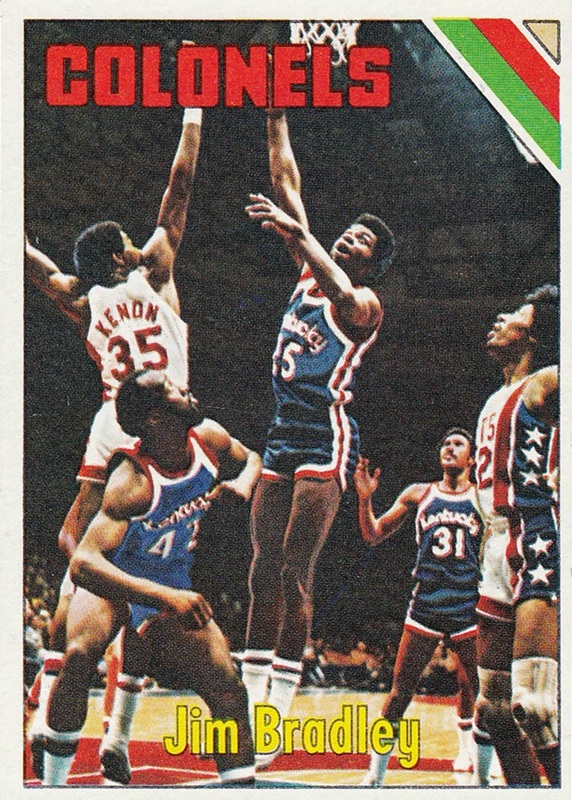 although quite a few of the "action" photos are of players standing around, like so. I completed the set on November 30th, 2002. A comic store we visited bought a collection and took in the entire set of 1975-76 and a handful of other vintage cards. 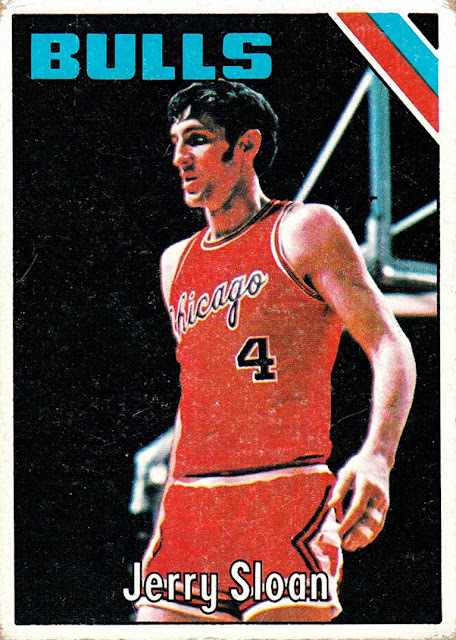 It was the only time that shop ever had any basketball cards. The first set to appear in the countdown that was issued before I discovered the sport's existence. It won't be the last! Why I like it: It's all about the design here. 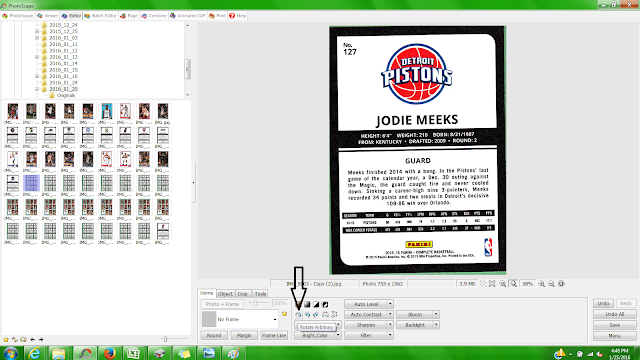 Set size/Completion: 375 cards, I have 367 of them, 98% according to the Database. 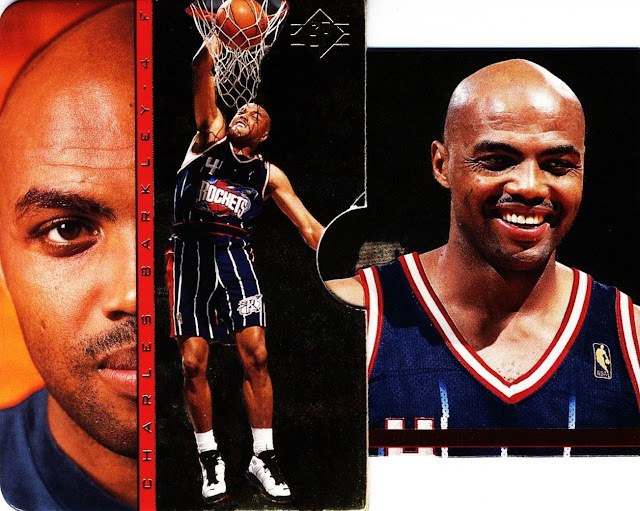 1992-93 Ultra was the first NBA release for the brand, and I am not going to hide it- Ultra is my all-time favorite brand. It was issued from 1992-93 through 2004-05, and again in 2006-07 and 2007-08. There is only one design I don't really care for in that entire time, and there will be more Ultra in this countdown. That green marble design...I love it. Green has always been my favorite color, and I've always been drawn to marble design. There's really no way I could not go for this set, and I did! The fronts feature action photos that, while perhaps not as dynamic as later Ultra issues, are certainly good photos that are not duplicated on the card- you get three photos on each card! The name bar and team bar are color coded to each team, as well- again, something I like. 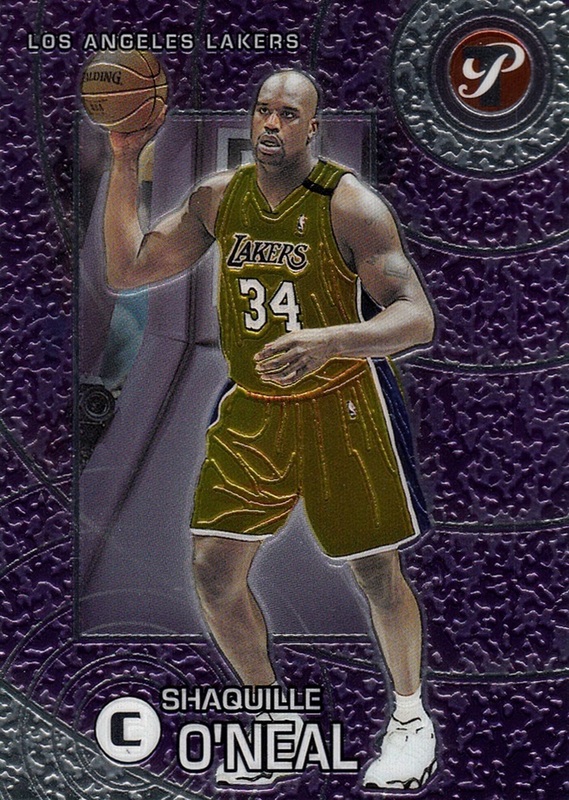 the entire back of the card is based on the colors of the team floor. There's not much in the way of stats on the back, but that's fine- that was included on the flagship Fleer set, and you really only need one set per year to include stats. 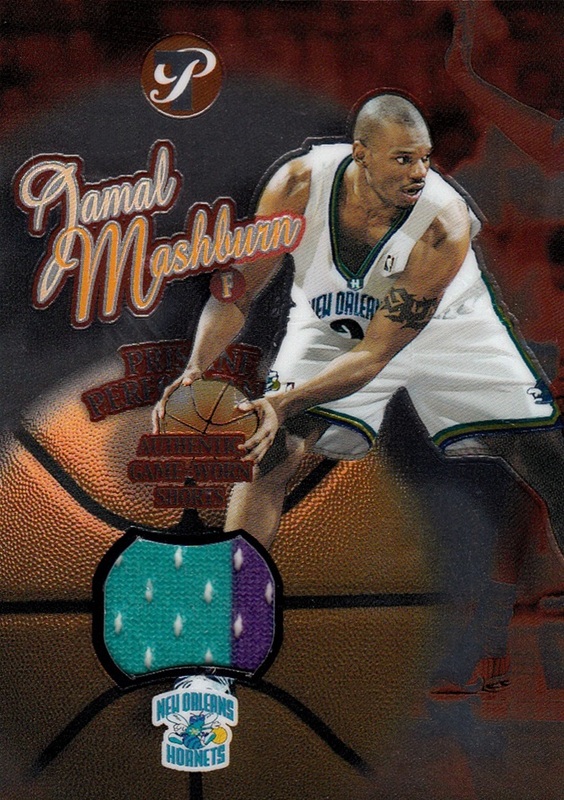 Throughout the years, series 1 (cards #1-200) have always been harder to find. In fact, I was missing more than half of them but got most of them in trade in 2014 and 2015. 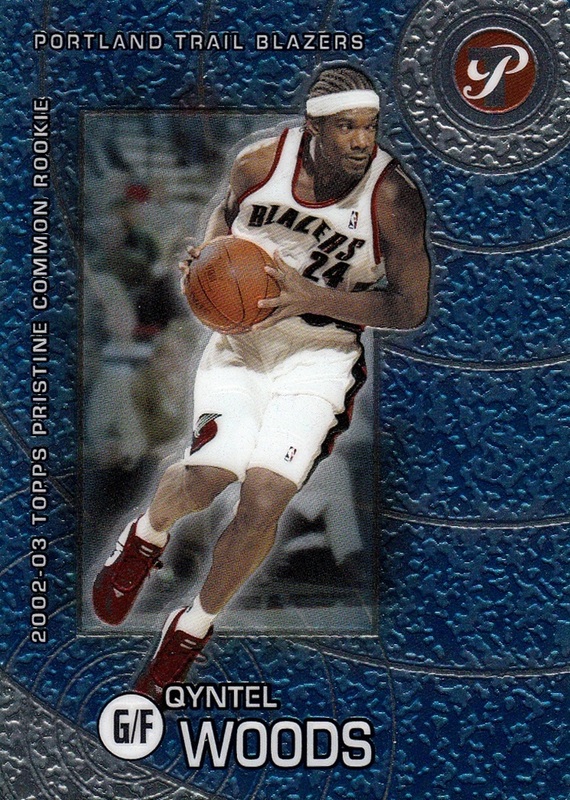 I am only one card short of having the entire second series- I'm missing #271, Robert Horry. The rest of the cards I'm missing are all series 1. There are 6 inserts in the set, most of which would be staples in Ultra for years to come. 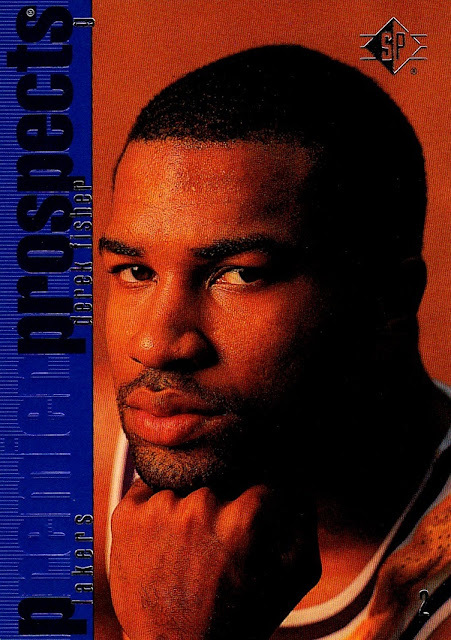 All-NBA, All-Rookie, NBA Award Winners, Playmakers, Rejectors and a Scottie Pippen insert that I believe may have been a mailaway, There are also autographed versions of the Pippen cards- very early autographs, with the first being issued only in 1991-92. I've never seen one. I only have two of the inserts scanned and ready to show. I have to admit that All-Rookie design on the Walt Williams card is much more interesting than any of the other inserts issued in the set. Sometimes, something just works out where you end up liking it despite the fact that it doesn't fit with everything else you like. Normally, I can't stand when the background of a photo is edited out to make room for a computer generated design. I also normally can't stand high end sets. Yet this one is both of those, and I love it anyway! It's also a small set, something else I don't like. Why I like it: Memories mostly. 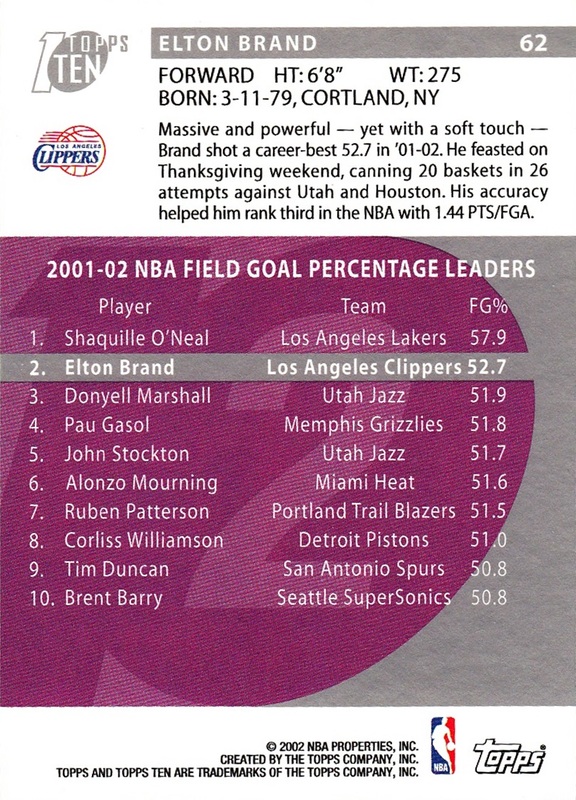 2002-03 was an interesting time for me. Not all of it was good- I lost my dad in 2002, and I don't have a lot of good memories from that time. The only good memories I have from that year are related to cards. I got more cards in 2002 than in any other year of my life. Set size/completion: 125 cards, I have 76, or 60.8% according to the Database. It is the smallest set and the lowest percentage of completion among sets that make my Top 20. This card shown is actually the refractor- the only time in this countdown that a base card is not the main image. I love the Refractors in this set. The rookies are the most common, and the base rookies all feature this blue background. 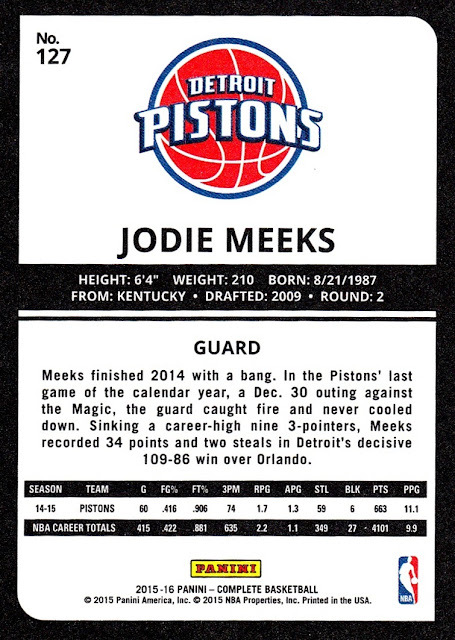 The veteran player cards are team color-coded, and the veteran refractors are limited to 99 copies each. The base blue rookies, like this one, are SN1899. This set was the most high end Topps issued in those years, and normally I can't stand high end sets...in my opinion they are everything that's wrong with the hobby. Yet I love this set anyway. Go figure. Each pack was 3 in one. 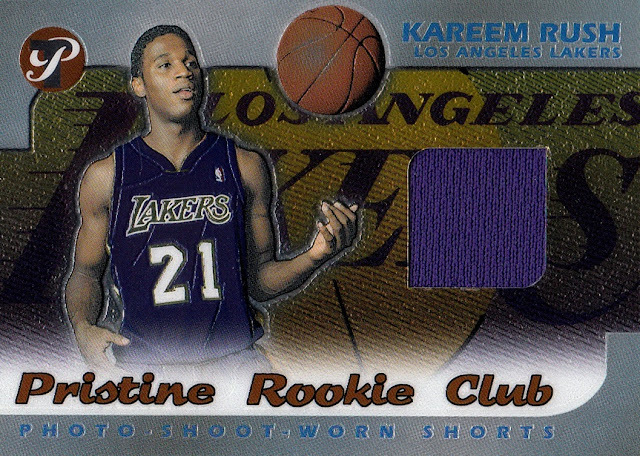 There were base cards, then a rookie sealed inside a plastic case, and a single packed relic card in each pack. 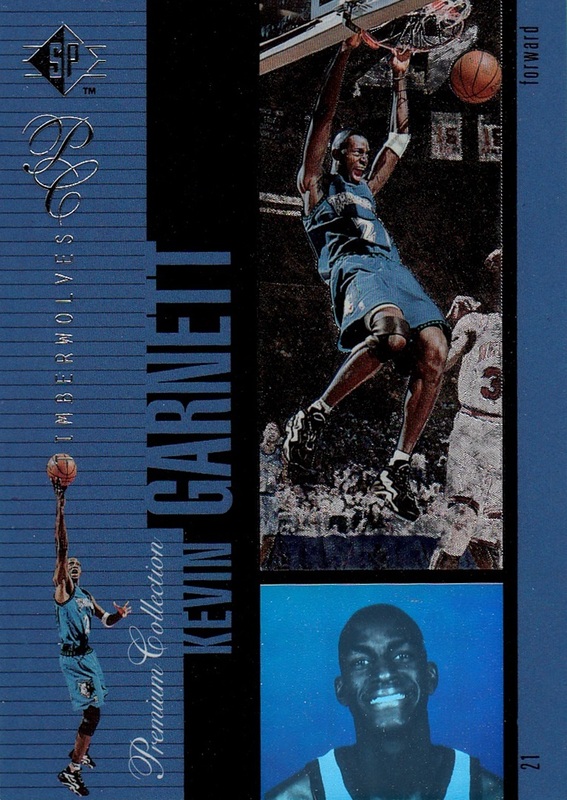 There were three different cards for each rookie in the set. The main one, the blue design as shown above, was unnumbered. The second design was numbered to 1499 and the third rare design to 499. Here is what a non-refractor rookie looks like. 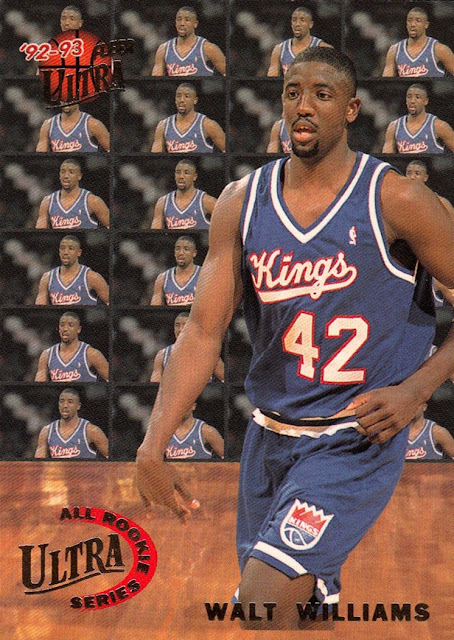 Chris Wilcox is the only rookie in the set where I have all three versions, although I have not scanned the basic blue one yet. Although the set is a favorite of mine I have only scanned a handful of them. 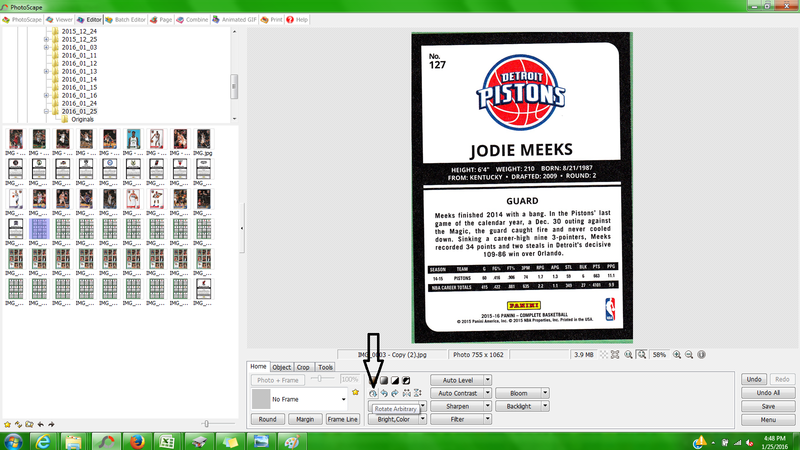 Only three veterans have been scanned, even though I have more than 20 of the 50 in the set. As I related in the most recent HOST, I am not even yet to halfway in scanning. There were LOTS of relics in the set. Each pack included one. There were also refractor versions of each relic, which were SN to 25. I am lucky enough to have two of them. 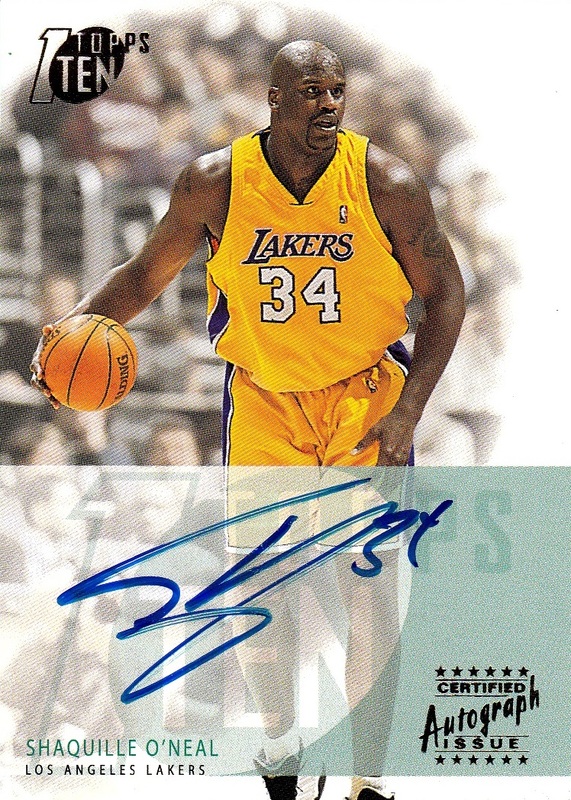 The Personal Endorsements autograph insert reached it's multi-year peak, printed on clear acetate and featuring on-card autographs. I have extensively chased all the relics in this set, but even so I have no more than 8 cards from the largest representation, and only 2 from the smallest. Here is the back of the base card. As it turned out, position #19 was the hardest one to choose. This is actually the fourth different set I had originally had slotted into the spot. Then I got to thinking about it more and I realized I liked another set more than the one I currently had in the slot. This one eventually won out. 19 was harder than 20th because although I love the concept of the Topps 10 set, the design was weak enough that it earned a spot in the top 20, but I knew it would go no higher. Why I like it: It's size. 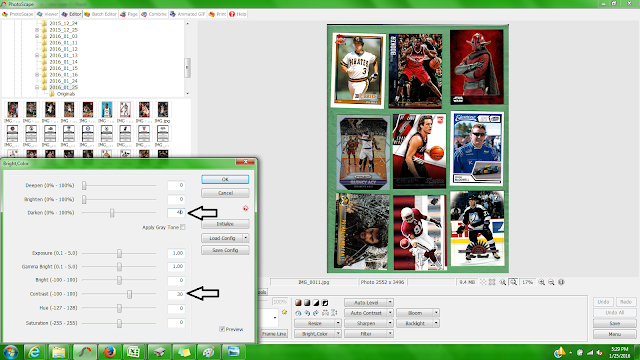 At 440 cards, it covers most of the players in the league. 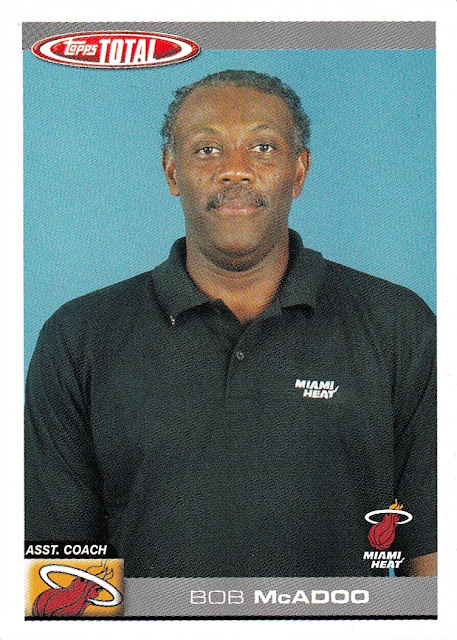 Even better, it also includes coaches and was the first set in NBA history to include assistant coaches and mascots! 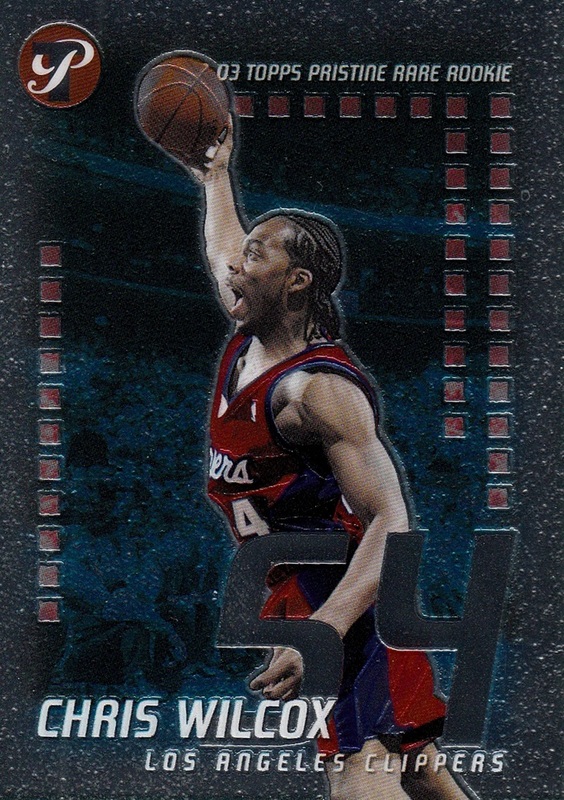 The 2005-06 Topps Total set is the only other set to do so, but the design of the 2004-05 set is much better. Set size/Completion: 440 cards/I have 332 of them, 75.5% according to the Database. 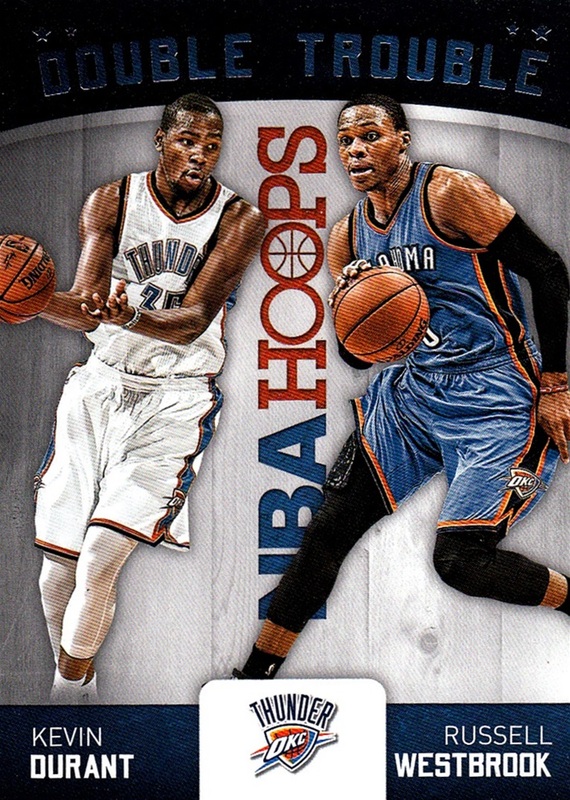 The concept of the Topps Total set was to include as many players as possible- something I had hopes for 2015-16 Complete, but Panini only issued 330 cards while the NBA has 450 players. 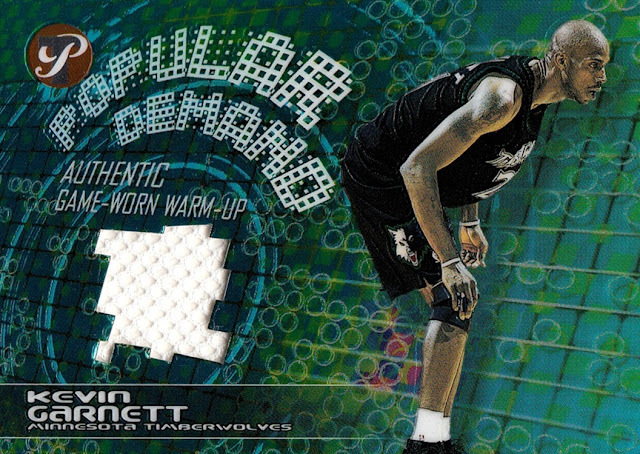 The 2004-05 Topps Total set also included what I believe are the first card images taken from a practice facility. The back of the card is a bit of a letdown. Most of the back is filled with useless stuff. 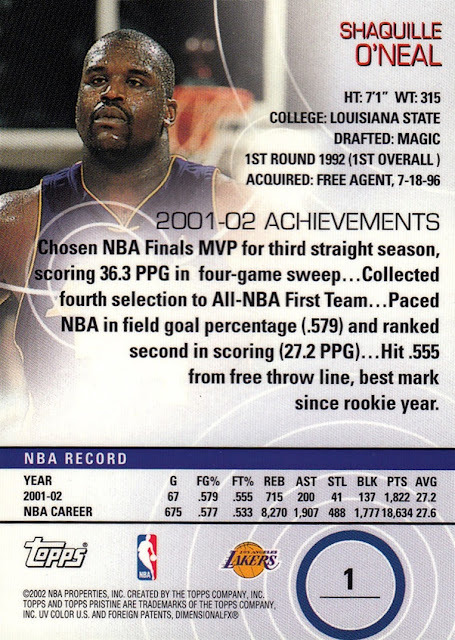 A concept called Total should have included career stats, and it barely even touched the previous season's stats. But it was colorful, which I like. This is the only printing plate I've ever pulled for the NBA. I have some others that I got on Ebay. 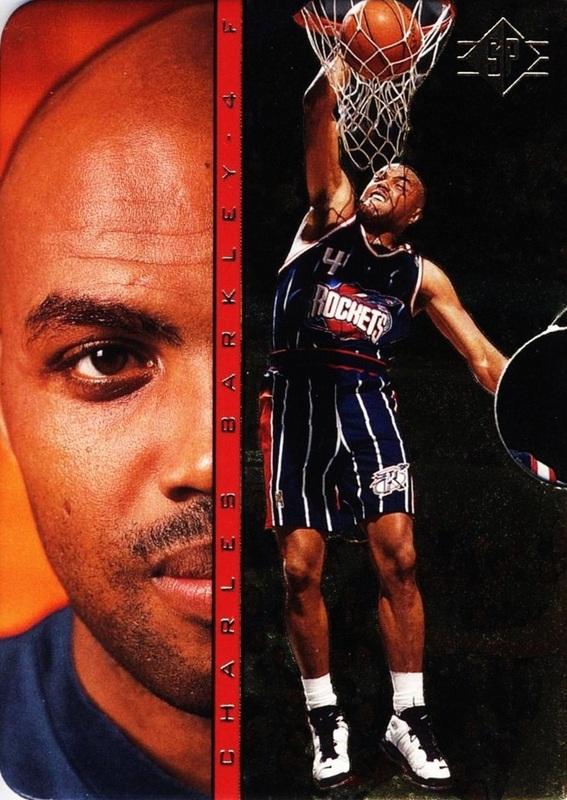 It's hard for me to believe, but February 14th, 2016 marks my 20th anniversary as an NBA fan! For many years I thought that it was the last day of the 1995-96 NBA season when I discovered the sport, but thanks to the statistics available on NBA.com and basketball-reference.com I determined that it was, in fact, February 14th, 1996 instead. I've been trying to decide what I wanted to do to celebrate, and most of the ideas required spending more money than I have to spend on the hobby. (IE, open a case, something I've always wanted to do, attend a game- even the Westchester Knicks in the D-League are too expensive). But I came upon the idea that I would do a countdown of my 20 favorite sets...and tell you why they are my favorites as well. Not only that...I'm going to post one set a day, every day, from now until the 14th, with my favorite set being revealed on the actual 20th anniversary! Figuring out the order of the top 4 was easy. Fifth through 13th was hard to figure out. There are a lot of great sets in there and I knew they would be in the top 20 but the exact order was not particularly easy. 14 to 20 were harder to determine. There were several sets that I really like a lot that didn't make the cut...some of them that missed it, and some that made it, truly surprised me. The ones that didn't make it surprised me the most, because I know which sets I favor, but I had never ranked them before. As you see me reveal the countdown each day, you'll notice some themes that I will point out at the end, unless they are commented on beforehand. Why I like it: The concept of the set. Of my top 20 this is my least favorite design, but the concept of the set is so strong, it puts it into the top 20, albeit 20th. Set size/Completion: 150 cards, I have the complete set. The concept of the 2002-03 Topps 10 set was multiple subsets highlighting the top 10 leaders in various statistical categories, and the top 10 draft picks in each position to make sure that rookies got into the set. This is the concept that makes the set work for me. 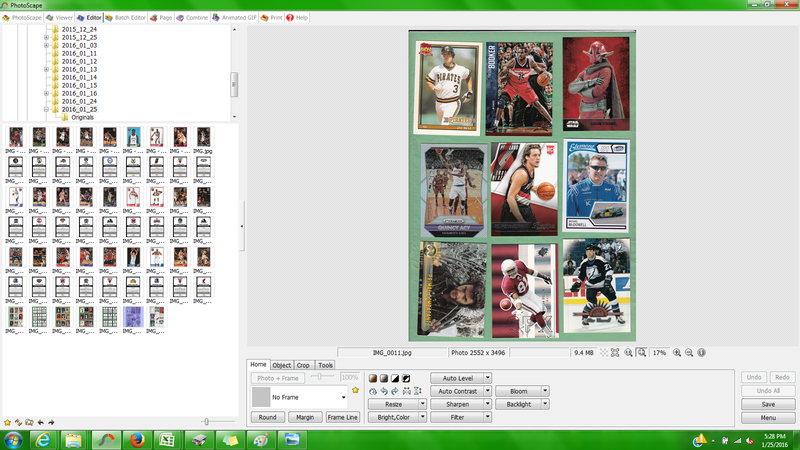 A big part of card collecting for me is documenting the history of the sport, and most sets fall well short of that. In this case, that's ALL the set is. The design is fairly poor, with a lot of unused white space. Each category got it's own theme color, which also transitions to the back. 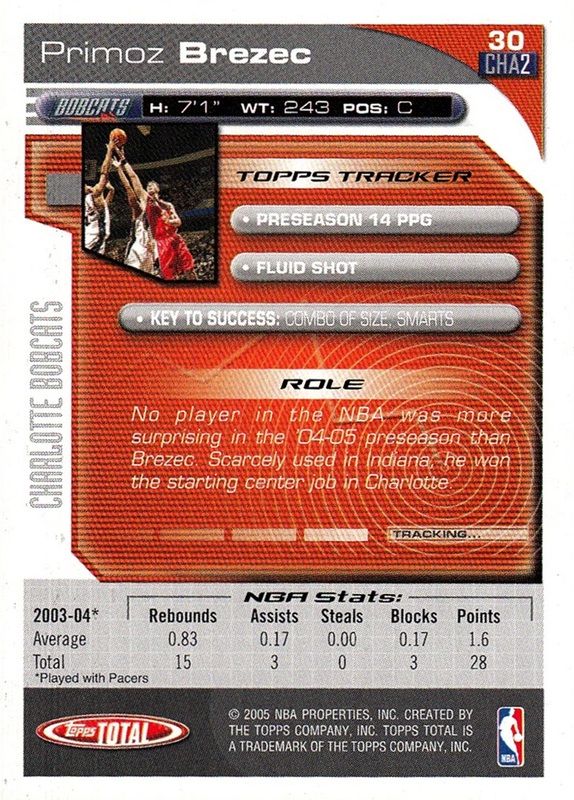 The back of each card is mostly a list of the leaders in that statistical category that card is from. There was not much in the way of inserts for the set. Each card had a gold parallel, which was thicker- something Topps did with the parallels often at the time- and there was a partial parallel where the number rank is replaced with a relic piece. 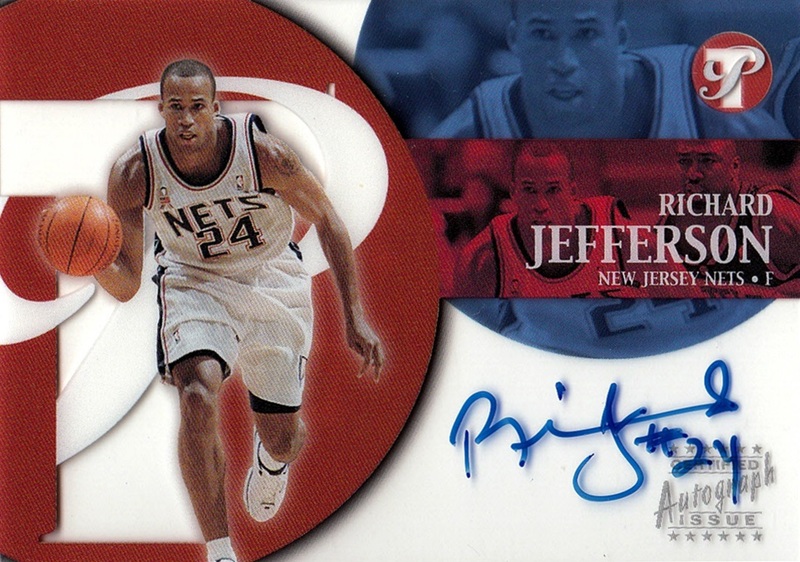 There is also an autograph set and a Team Leaders insert which looks very similar to the base card but is a relic set. I completed the set on January 9th, 2003, which is shortly after the set was released. I may have even completed it from a single box, but I don't remember anymore. I wrote this up as a "page" to appear on the top of every post, but this is such an important post that I felt it deserved to be posted as a standard post as well. I take a lot of pride in my scans. I spend the extra time and effort to make them look like the cards in hand do (or at least as close as possible- some, like Finests and foils, do not scan properly no matter what you do), and lately several people have noticed my effort and complimented me on it. I appreciate that my work is being noticed and I thought I would take the time to show YOU how to make your scans look their best! I am going to presume that you already know how to make scans while reading this. I can't really tell you how to do that because each computer/scanner is different. So...the first thing you need to do is download PhotoScape. This is a FREE program and does not come with malware or adware. I've been using it with no issue since 2009 or possibly even late 2008, I don't remember exactly. EVERY scan and EVERY photo I've taken since I discovered the program has been run through PhotoScape. Each scan needs to be edited, and I also use it to put my copyright on my photos...but that doesn't apply here. It only takes a couple of minutes to download, but it does take some time to master the program. 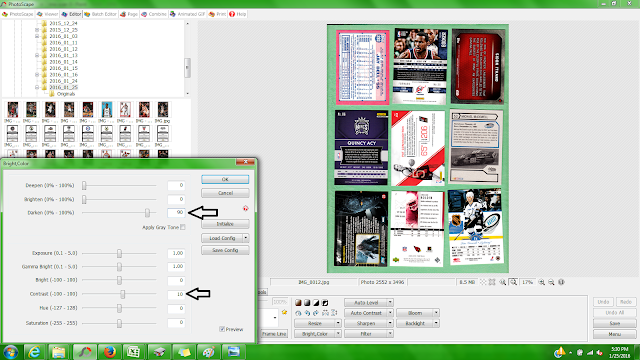 I still find new features that it has, but I mostly use it for cropping and editing the scans and photos I make. If you saw the gifs I made for the new Star team sets I got for Christmas 2015, those also were made with PhotoScape. OK, so now you've downloaded PhotoScape and you have your cards scanned. Now you have to find where you have the scan stored using the PhotoScape program. Again, this varies by computer. My scanner is set up to create a new file each day in a "Scans" folder I created. 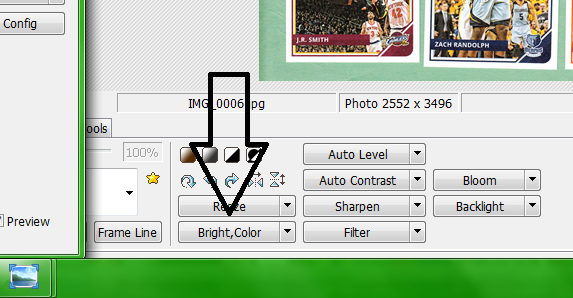 You can find your scan using the top left portion of PhotoScape after you click on "Editor". You then click on an image you want to work on and it shows up in the large main "working window" on PhotoScape. (Note: You can manually adjust the sizing on PhotoScape, I have it set up to show nine scans across- the number you can fit on a page of standard size cards) Also remember you can make each image I've posted here larger by clicking on it, to see more detail. Here is the raw scan. The front scanned pretty well, so it only needs the standard color edit. Click on Bright, Color and the editing box opens. The standard color edit is 30 contrast, 40 darken. It does not matter which you do first...and in the small preview, it may look like it's not accurate, but when you crop the cards down, it's right. I don't know why it works that way but trust me, after more than 100,000 scans, it is. Note that the preview image has changed. This happens instantaneously. When you are happy with the colors, simply save. You can either do this on the far right side of the screen, or by hitting Control+S. 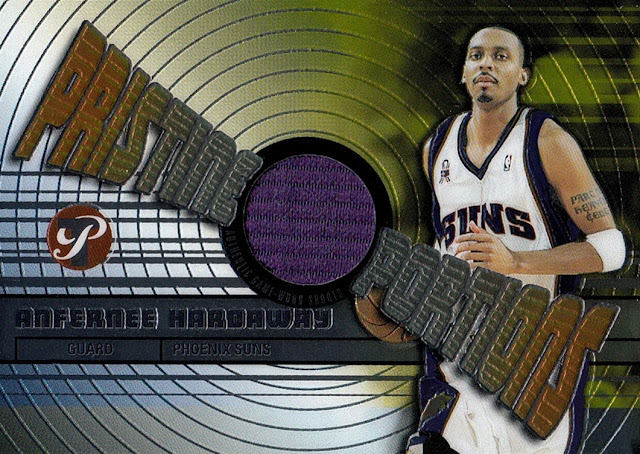 The backs of the cards usually don't scan as well, usually much more washed out, like so. For some reason scanners usually put a grayish film over each scan. When that happens, you have to adjust the colors differently. You have to use much more "darken" and much less "Contrast". It's not uncommon where I have to adjust the Darken to 140 for pages that are mostly white but not all white. (all white- like checklists for example, usually need no editing). This page needed 90 darken and only 10 contrast. Sometimes no contrast at all is necessary. Each scan is different and must be "played with" until you get it right. Don't be afraid to "undo" and try again. Trial and error is a must and each scan, like I say, is different. Once you've learned how to adjust the color, and are comfortable with doing it, it takes literally three seconds to adjust the color for the a set of scans. (yes, I counted) It seems like a lot of work to do this, but once you are familiar with it, it goes quickly. 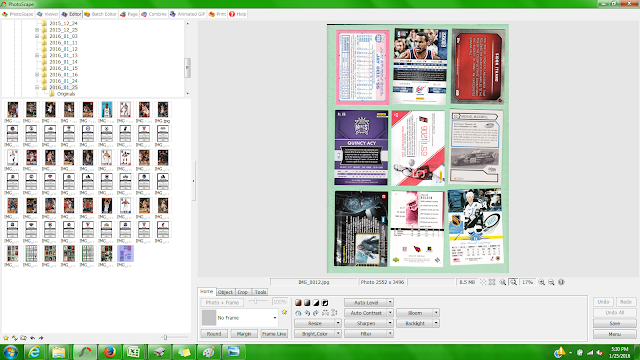 I've scanned and edited as many as 700 cards (both front and back) in one day before, all using PhotoScape. Now that you'd adjusted the color, you have a page of 9 cards but they are still all together. I make 8 copies of the image, and crop them down. The crop in PhotoScape is the best I've ever used, and really needs no instruction. Back before I discovered PhotoScape, I would fight endlessly trying to make sure each scan was lined up properly, and when they weren't, they would be deleted and I'd have to try again. After 10 times, this can get very frustrating. With PhotoScape, you don't need to worry. You can see this scan is crooked. I've cropped it down from the page of 9 scans. The tool the arrow points to rotates the scan. The box that opens up has a sliding bar that you use to correct the scan. Problem solved! The arrows to the right of the arrow I made rotate the scan left or right. A very common thing to do, I will use it 4 times in the set of scans up above. But wait, there's a bit of scanner scuzz over the second K in Kentucky. That too can be fixed with Photoscape. The green arrows point to the scuzz and also the Tools tab and "Clone stamp" Use the Clone Stamp to copy a small piece of the black from elsewhere in the border to cover the scuzz over the K.
A sheet of green construction paper between the cards and the scanner lid provides a better color balance to begin with, and also helps to ensure you have cropped the cards properly. 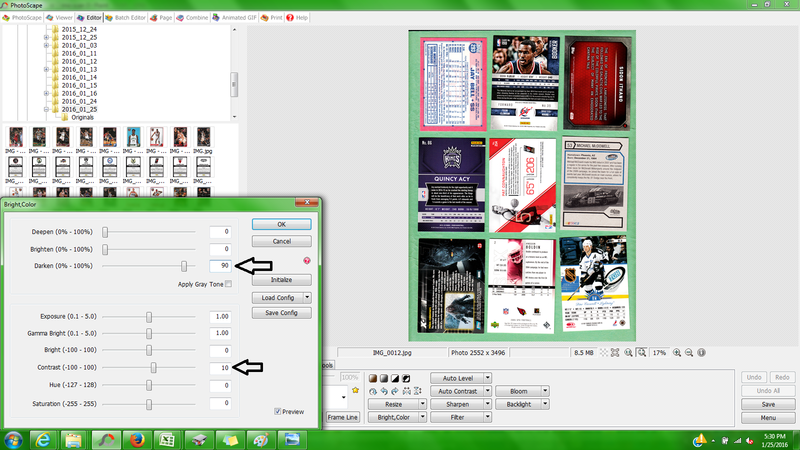 It also prevents the scanner from cropping what IT thinks is the end of the card. You ever see scans where the white border was missing? 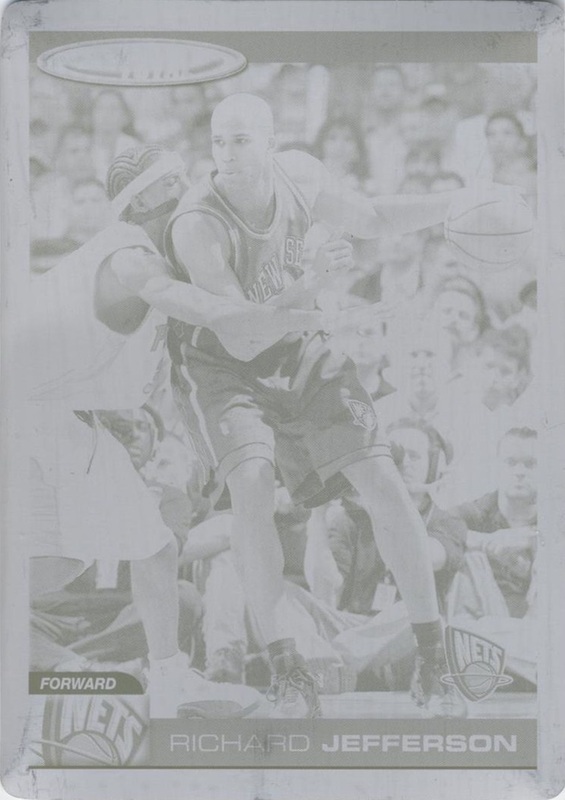 That's because the scanner couldn't tell the difference between the white border and the white of the scanner lid. I only use the standard white backdrop for die cut cards, and white die cuts get scanned with black construction paper between cards and lid. Do NOT mix Finests or foils in with other cards. They MUST be done with other Finests or foils, or else they will not look correct- and they can't be made truly correct anyway. But the won't appear all black if you do them together. For Finests and foils my standard edit is 30 contrast, NO darken. Do NOT mix old-school brown back cards with other cards. Either truly vintage or Heritage style cards, they must be scanned with other cards of the same style, or else, again, they will not look accurate. There is no standard edit for the brown backs, as they don't always scan the same, even from set to set. Refractors and Prizms CAN be scanned with other cards of any sort, as is shown by the Quincy Acy card in my example. You will find some cards scan the best only when they are with other cards from the same set, or else the color will be all wrong. A good example is 1999-00 Topps NBA. The border is bright orange, but if you try to scan them with other cards, it appears red to brown. When scanned with other cards of the same set, you can maintain the bright orange. 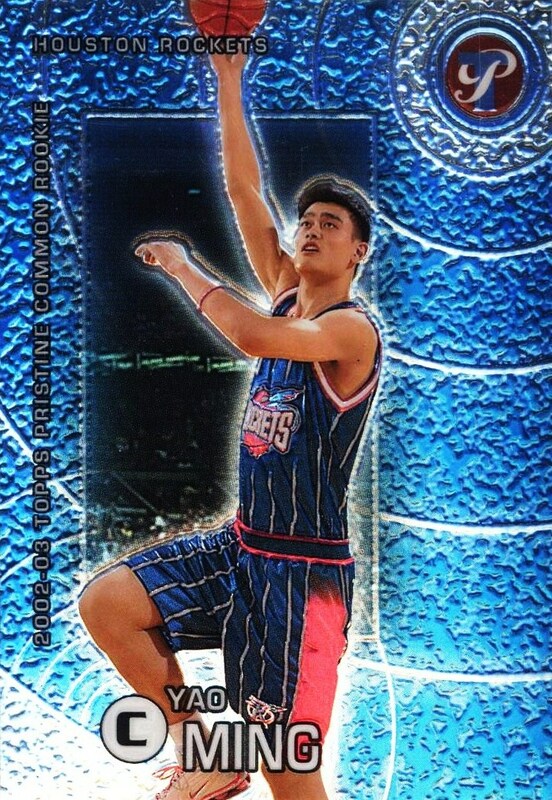 Another example is 1992-93 Upper Deck NBA base cards. If you scan them together, the colors on the back stay correct, but if you scan them mixed with other cards, the NBA logo behind the stats and writeup disappears. The more you do, the more you learn, of course. The whole process is very fast and I actually find it enjoyable as well. As I said, I've done more than 700 images in one day. 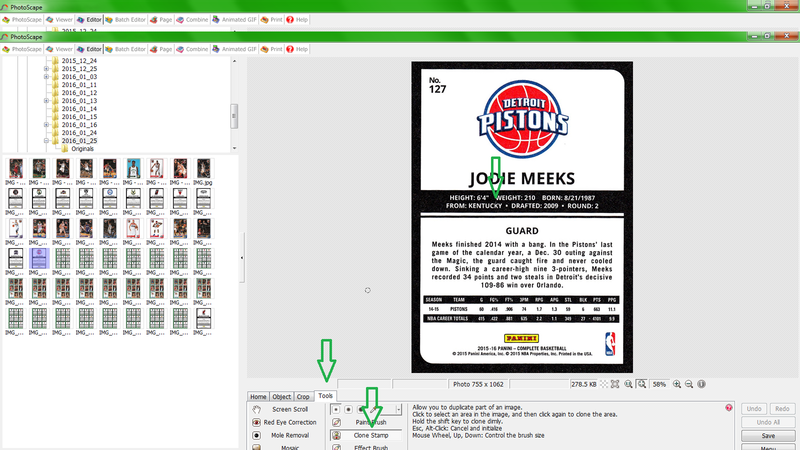 (although that IS pretty rare, I average around 250 cards scanned per day). Hopefully this helps you make your scans the best and look just like the cards do in hand. There's no reason to accept the grayish film the scanners always have for some reason. It's been a while since I've posted one of these. First, I went offline while I was waiting to see the Force Awakens. Then, I was working solely on the cards I got for Christmas not one but two weeks in a row, which I couldn't really post in a HOST because they were getting a post dedicated solely to them. I also took some time off for scanning to do some typing, as related in my Goals for 2016 post. Ironically, this first one is a redemption I received from Panini, and it's likely going to get posted before I post the box break the redemption card came from! (I took advantage of the Dave & Adam's Black Friday sales this past year for the first time). 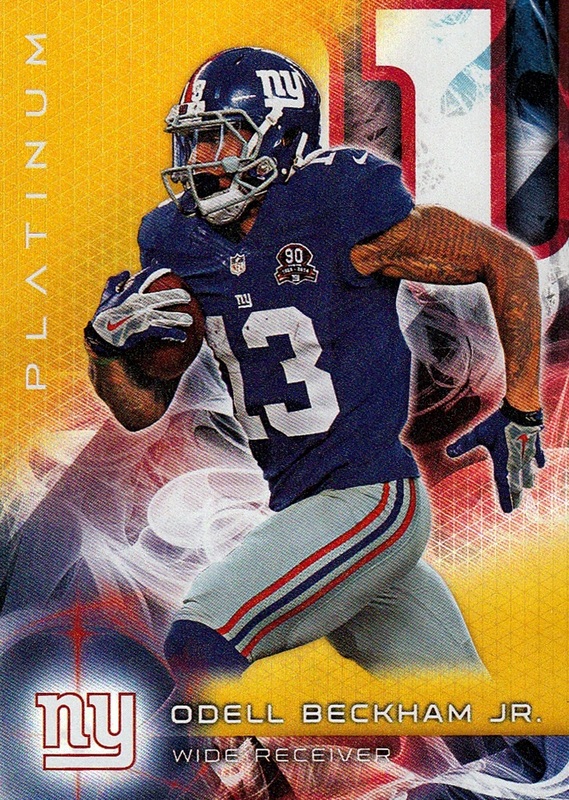 The redemption had expired over a year ago, but Panini still honored it. While my relationship with Panini has been somewhat adversarial at times, this is nothing but admiration (of their handling of redemption cards) I've been in this hobby for 28 years now, and this is something Panini has done better than anyone else in that time. Thanks to this card, I now have the autographs of 4 of the Warriors starters. I am only missing Andrew Bogut. I also have Festus Ezeli's autograph as well. 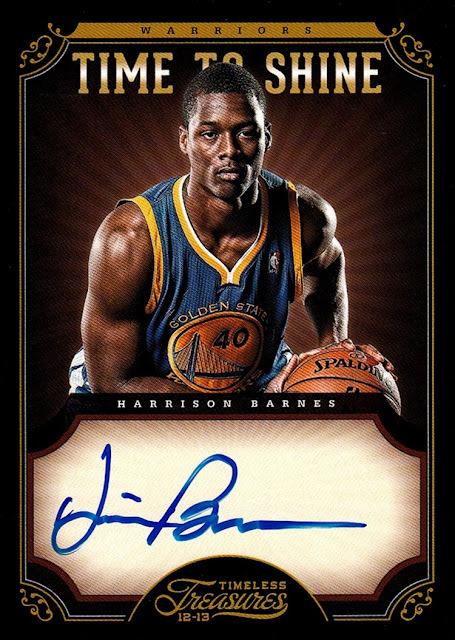 The Warriors are my current favorite team to watch...although now that Elton Brand is out of retirement I will probably not get to see them as much. 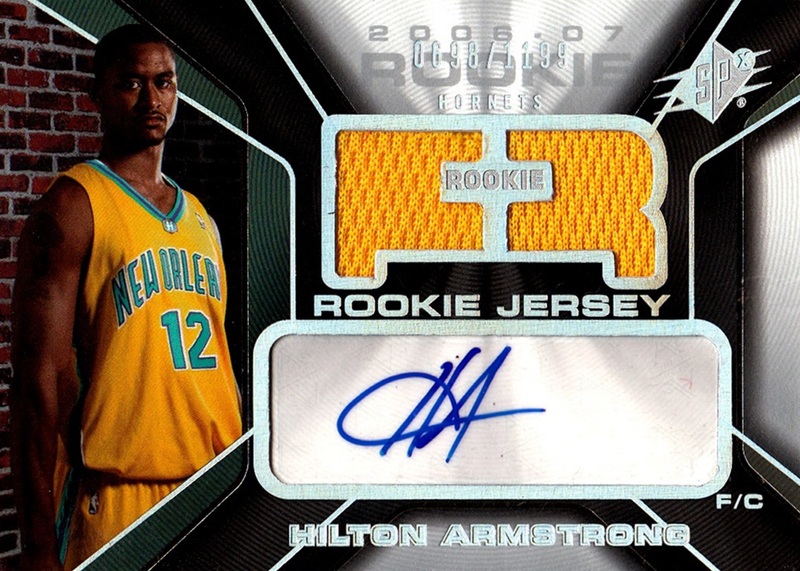 ...the seller of the Hilton Armstrong card included 4 bonus cards. They are all football, all from the same set. I never turn down free cards no matter what the subject is! I've actually heard of both of these guys, which is not too common for me with football. (Who HASN'T seen Odell Beckham Jr.'s famous catch?) I just read an article about Cam Newton in Sports Illustrated recently, as well. 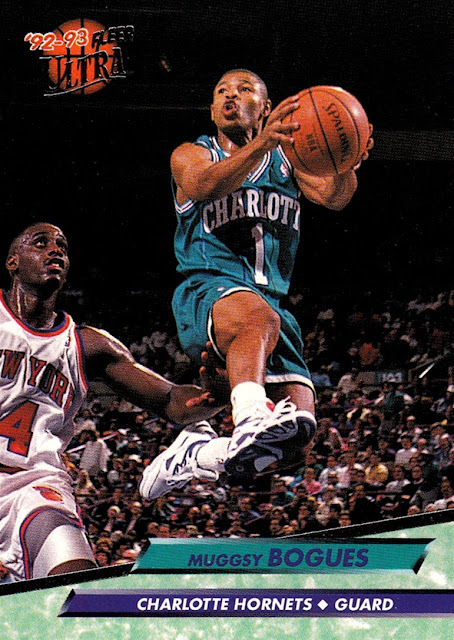 He's also shown up courtside at several NBA games this season also. I bought a blaster box of Hoops in the hopes that I'd be able to complete the base set. I am not doing well in that regard...I am still 20 cards short, about half of them rookies, which fall 1 per pack. I am still missing the big names, as well- no Porzingis, Towns, Russell, or others yet. I have gotten some more of the inserts and a couple of parallels, and I have gotten some of the cards I didn't get with my box, so it was not a waste of money....and I have not finished opening it yet. I will have to check and see if my local Target has put out a Knicks team set. 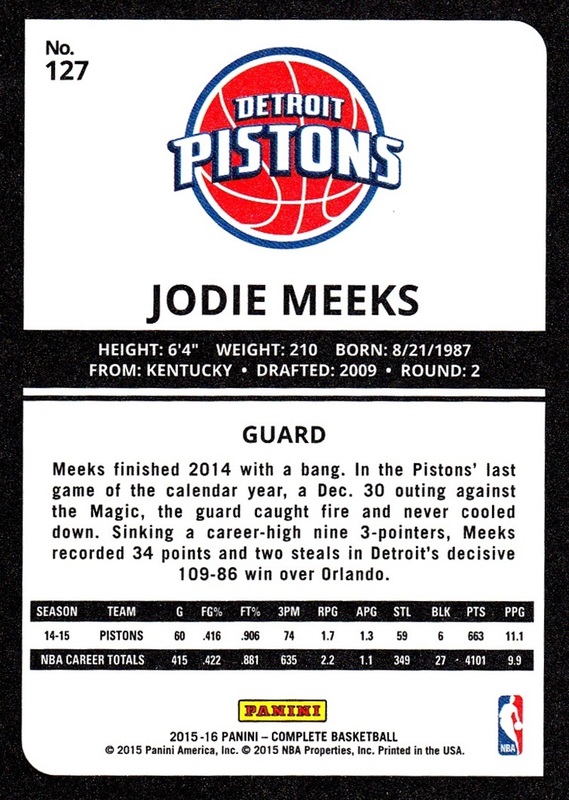 I know they have been issued, but they did not stock the 2014-15 team set...possibly because a 2012-13 one still occasionally comes out of the stock room. 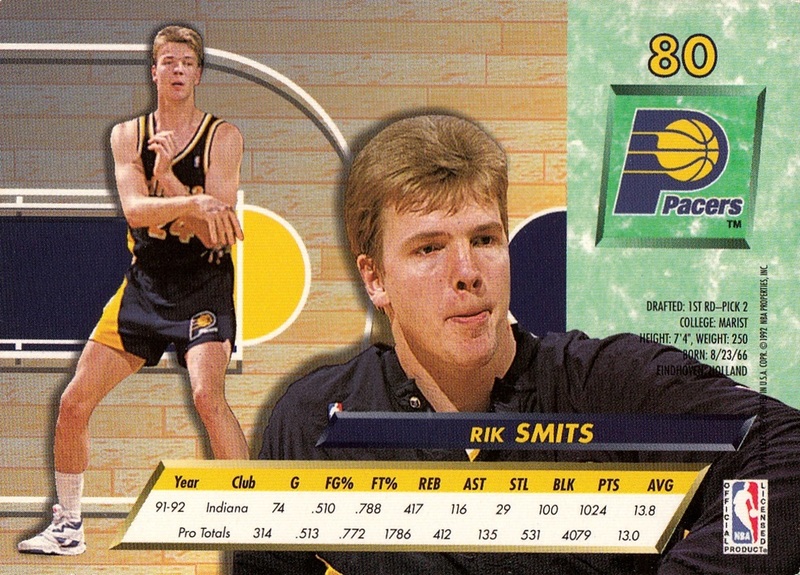 I do want that Porzingis card. After I finished typing up all my relic/autograph/SN cards, as related in my last post, I finished filling up the plastic cases and typed a round into my Excel chart. After I fill each of the 42 plastic cases, I sort them by person and then type them into my Excel chart. It normally takes me about a week to do this and this time was slowed by a health problem that caused me an immense amount of paint for several days. Here are the cases all filled. One thing that I like about the cases- and why I photograph them every time- is seeing the edges of the cards. Here, you can see a batch of 2014-15 Donruss (third case from the left, third row down) and the box of 2015-16 Hoops my mom gave me for my birthday- and ended up being the set I got the most cards from in all of 2015- in the 3rd, 4th and 5th caes in the next to last row. Another view. I began filling the cases on 9/28/15. Sorted by first letter of last name. I then sorted each letter by person, and then typed them into Excel, but I didn't photograph any of that. The cases now empty, waiting to be filled again. In this batch I did exactly 5400 cards, although the number is slightly inflated because I also got out the oversized cards and the cards trapped in the plastic cases Topps favored from 2001-02 through at least 2005-06. It generally takes me a long time to fill the cases- since I started keeping track of when I finished each batch of cases, I've never done more than two in one year. However, I only started keeping track in 2013. 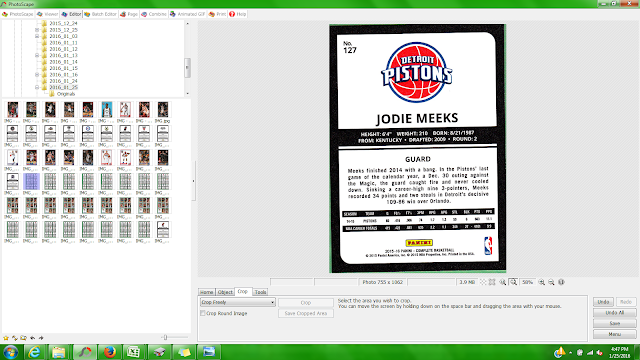 Furthermore, the next batch I do will put me at halfway in scanning my NBA collection. Halfway is 41,281 cards. I have scanned and entered 39,530 right now, and each completed round of cases is always at least 5000 cards, so I will hit it at some point soon...probably by the time of the Daytona 500 but I won't have any way to know when or which card it is. 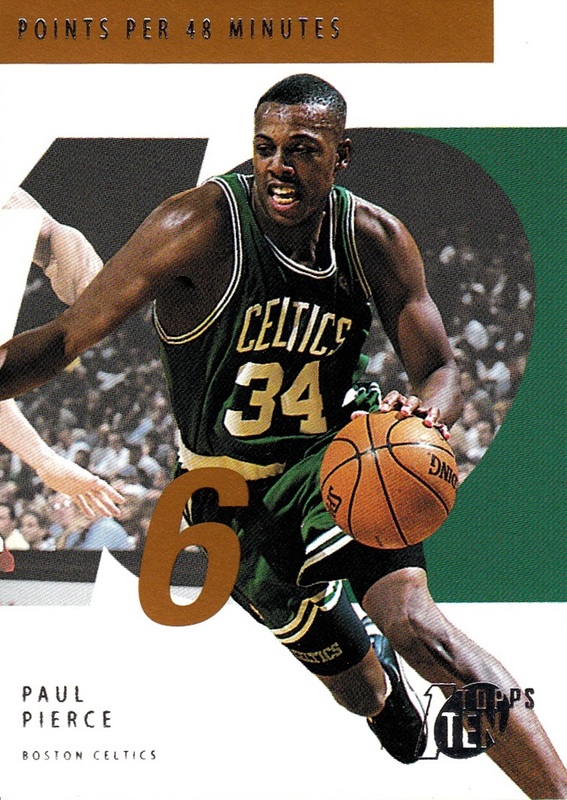 And, of course, each new NBA card I get changes the number that is halfway. There won't be any HOST for a couple of weeks....I will be starting a very special project this week that will preclude posting it.